With 8,000 lbs of hot water and people your hot tub deck design had better be engineered to stand up to the test or it could be disasterous. I have received a lot of emails from visitors asking us how to actually design and calculate the loads and forces that a typical hot tub exerts on a deck. And I'll admit, if you are building a deck for the first time, this is one occasion where you don't want to make a mistake. Hot tubs with water and people are heavy. But how do you design a deck to easily support a hot tub? What size of posts do you use?What is the right joist span?How big should the joist be?What about the beams? Well, without doing some load calculations you will only be guessing... and potentially flirting with disaster. Thanks to Builder's Engineer they have developed a very useful software package that is useful for average folks to do all kinds of load calculations, stair layouts, joist, beam and post size calculations. So on behalf of all our visitors to DecksGo.com we sincerely thank Tim Garrison, the guru behind all the Builder's Engineer for his very thorough explanation of hot tub deck design. *As of 2019, support for Builder's Engineer has been discontinued. For more information click here. An alternative can be found at The Structural Engineer. 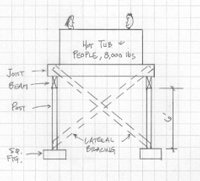 Greg from North Dakota wrote us and asked us to please solve this very problem because he was trying to design a hot tub deck to withstand 8,000 lbs of force. Greg's hot tub was 8'x8'. A very common size but he wanted to design his deck so that the top of the hot tub sat flush with the deck surface. But the surrounding deck was fairly high off the ground so the hot tub had to be supported by an elevated substructure. The software made a breeze of this little hot tub conundrum and gave a number of options for beam sizes, post sizes, joist sizes and footings. Read all about it in the pdf version prepared by Tim Garrison. 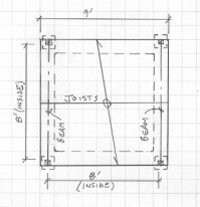 Also read each of the following reports on beam size, joist size, post size, and footings to see how Greg's question about hot tub deck design was answered.